Eagle Tree offers a variety of FPV (First Person View) equipment for your recreational model airplane, multirotor, or surface vehicle. Hobby FPV (which stands for First Person View) in its simplest form regards adding a small video camera and video transmitter to your model. 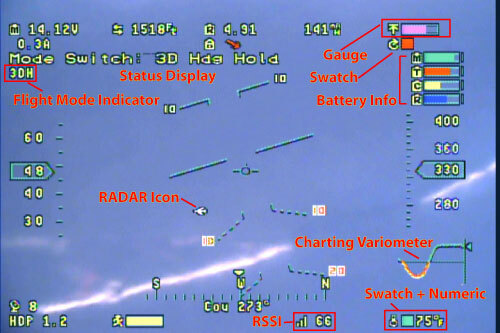 Then, with a video receiver and a video display (video goggles, a video monitor, or both), the pilot/copilot can view the image from the model in real time, which gives the effect of "being in the cockpit." Please refer to the block diagram below. Note that typical RC equipment (RC receiver, radio, servos, etc.) are still required, but not shown. Q: What about FPV legality and safety? Always obey the law when flying, and fly safely! Laws vary from locality to locality. Most video transmitters used for FPV flying require an amateur radio license to operate legally. Q: What Enhancements should I consider to my basic FPV equipment? displaying information about your model's battery condition, altitude, speed, location, etc. These devices are referred to as On Screen Displays, or OSDs. An OSD is shown in the above block diagram. To reduce wiring, weight, and cost, OSDs are available that do more than just display data. For example, OSDs can add stabilization to your model, add voice prompts to alert you to issues with your model, provide "Return to Home" (RTH) capability which will attempt to return your model to the launch point if your RC link loses signal, among many other features. A variety of sensors can be added to some OSDs, such as altimeters, temperature sensors, RPM sensors, airspeed sensors, and GPS, to further increase the capability of the OSD. * It is often useful to have more than one video output, for goggles, a video display, a digital video recorder (DVR) and perhaps other accessories. Ground stations often provide video splitters for this purpose. * Most FPV video transmitters are broadband "analog" transmitters based on 1950's technology, with relatively limited range when compared to the range of your RC radio. One way to increase the range of the video link is to use a more powerful transmitter, but that uses more battery power, increases the likelihood of interfering with your RC receiver and other equipment, and may not be legal in your area. Another way to increase range (and to look really cool!) is to use a directional antenna on the ground, with an automated antenna tracker. Some ground stations handle the panning and tilting of antenna trackers, based on the position of the model relative to the pilot. * Another way to improve range and video signal quality is to use two receivers on the ground, and to automatically select the one that has the stronger signal. This arrangement is called "diversity." Some ground stations provide diversity when two receivers are connected to them. * Sometimes it's useful (and also cool!) to display real-time data from your model on your laptop, for your co-pilot to see. Some OSD/Ground station combinations support this, by embedding the model's data in the video or audio downlink, and sending the data from the ground station to your PC, normally through a USB connector. Q: What FPV Equipment does Eagle Tree offer? Eagle Tree offers the powerful Vector full color OSD, which offers model stabilization, Return to Home, and many other features. We also offer the EagleEyes FPV ground station, which supports all the features described above, and more. don't plan on using our Vector OSD. All of our FPV products are listed under the FPV drop-down menu. Q: Do you offer FPV cameras, video transmitters, video receivers, or Goggles? We at Eagle Tree like to design cool, innovative gadgets, and leave the boring stuff to other manufacturers. :) In line with this, Eagle Tree does not presently offer cameras, video transmitters/receivers, or video displays. However, many FPV dealers offer these products with our products fully integrated. Please see the dealer list below. Q: Where should I order? We have a worldwide dealer network. Please click here for a list of dealers, or order direct from us if you prefer. Q: There are a lot of FPV products out there now. 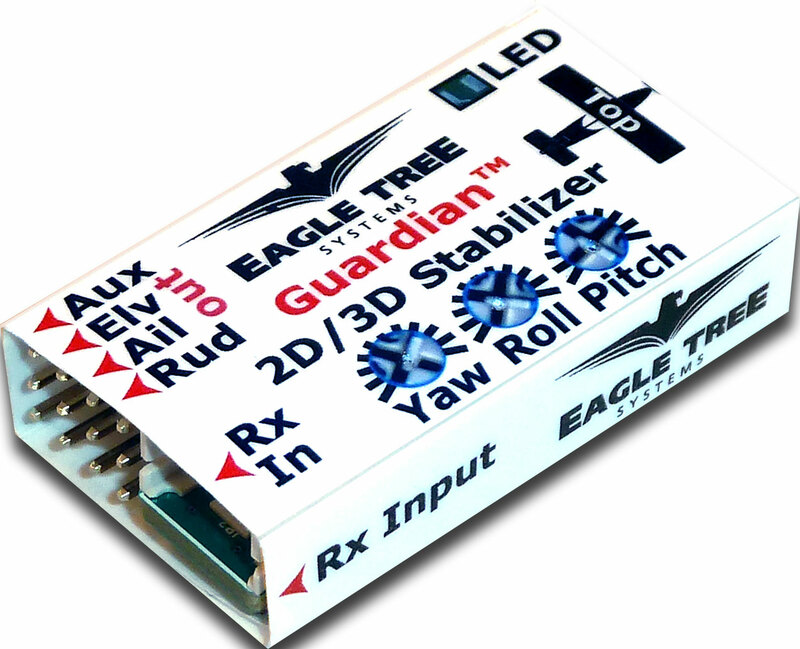 Why should I choose Eagle Tree for my FPV equipment? Eagle Tree has been a full time business since 2003, with dedicated engineering, sales, shipping, and support staff, and a worldwide dealer network. We build cutting edge FPV products, and fully support them via our web ticket system, telephone support, and our online forum. We'll be here if you have a problem - not just when you place an order. Further, most of our products are fully firmware updatable and are modular, making it easy to update and enhance them as additional features and capabilities become available. Your gear won't be obsolete the day after you buy it! We have several new products and accessories in development all the time. Q: I need more information on what's available. What should I do? * Click here to visit our support forum. * Click here to email us with questions about our FPV products! * Contact one of the FPV dealers listed here for information about video cameras, video transmitters/receivers, and video displays.